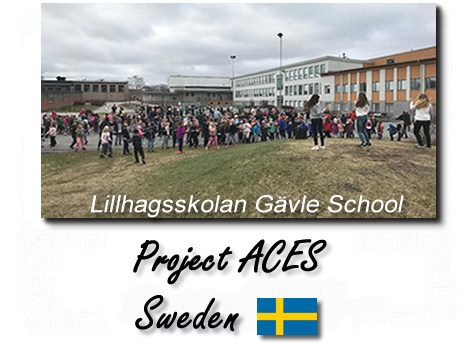 Welcome to the home of Project ACES (All Children Exercise Simultaneously), a signature program of the Youth Fitness Coalition, Inc. Project ACES was created by physical education teacher Len Saunders in 1989 as a method of motivating children to exercise. ACES takes place on the first Wednesday in May as part of National Physical Fitness and Sports Month along with National Physical Education Week. It has been labeled as "the world's largest exercise class" by the media. Since 1989, millions of children from all over the world exercise together to promote proper health and fitness habits. With the obesity epidemic facing the youth of the world, children's fitness plays a major role in fighting heart disease. 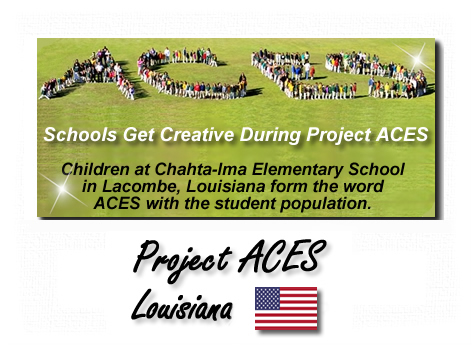 Project ACES hopes to address these issues with its big event in May, as well as schools that participate in daily Project ACES Clubs throughout the year. 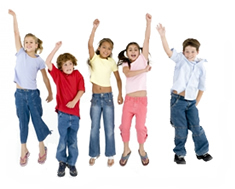 Introducing PACES Day.....The number of overweight children and adults around the globe has significantly increased over the last two decades. Over 20 years ago, Len Saunders created Project ACES which motivated millions of children to exercise in over 50 countries. Each year after a successful ACES event, Len would receive letters / emails from many parents asking him to create a program similar to ACES, but includes adults. These correspondences created the concept of a new event called PACES Day. PACES is an acronym for 'Parents And Children Exercise Simultaneously.' PACES Day takes place every weekend throughout the year, highlighted on the first Saturday in May. 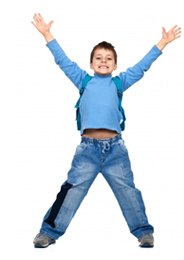 Children need daily, quality physical education in school, and exercise time at home (PACES). Visit the PACES Day web site by clicking here. Introducing a brand new event called Exercise US. The US stands for United States. The concept behind the Exercise US program is to motivate children to become physically fit and healthy by making fitness fun. Children will enjoy the concept of participating in 10 continuous hours of fitness from coast to coast. Schools or organizations that sign up will partake in 15 minutes of exercise at their location. When their 15 minute time allotment is over, they have completed their part of the program while the next group of exercise will start at a new location (which could potentially be in a different state). The program will begin at 8:00 a.m. eastern time, and finish at 3:00 p.m. pacific time. To learn more about this exciting event, please click here. Whether you joined us 30 years ago, 15 years ago, or 1 year ago.....please share your Project ACES stories and photos on Facebook, Twitter, and Pinterest. Please use the hashtags #ProjectACES or #WorldsLargestExerciseClass or #ProjectACESDay. The Youth Fitness Coalition would like to welcome Olympic hero Dan O'Brien to the Project ACES team as our lead spokesperson. Dan, also known as the “World’s Greatest Athlete” thrilled the world winning the gold medal in the decathlon in 1996. Click here to read Dan's full biography. The creator of Project ACES, Len Saunders has authored some health and fitness books. Please visit his bookstore to learn more. What happens if I can't start at 10 AM? Click here for the answer. Reports from leading organizations around the world are reporting that the current generation of children may be the first generation whose life expectancy could be shorter than their parents. The American Heart Association (AHA) is now stating that 25 million children and adolescents (age 2-19) in the United States are overweight or obese - that's nearly 1 in 3 American children. The AHA has also stated that "Most overweight children have at least one major physiological risk factor (besides overweight) for cardiovascular disease, such as high cholesterol, high triglycerides, high insulin or high blood pressure." 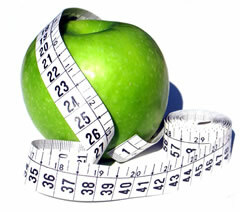 Obesity is becoming a global epidemic and a serious threat for both children and adults. The Youth Fitness Coalition (YFC) and the Project ACES web site are for advice and information only. Anyone participating in an exercise program does so at their own risk, and should be healthy and medically cleared by a doctor. If not, seek out medical guidance prior to engaging in any type of physical activity. Increased physical activity may be dangerous for some people. The YFC assumes no responsibility for any accidents, injuries, or damages as a result of any person's voluntary participation in any YFC or Project ACES activities or events. 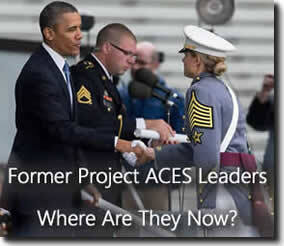 Project ACES has been around for decades. Many wonderful stories and experiences have come out of this worldwide event. If you have a great Project ACES story, and how it positively influenced a child, please tell us. Our current spotlight is on former Project ACES leader - - Brigade Commander and First Captain Lindsey Danilack. Please click here to read her story.